MusicMedic.com needle springs are heat treated and very rigid yet not brittle. New springs give a faster, cleaner, or snappier feel to the key work of an instrument. These Blued Needle Springs are made from high quality steel with a machined point and consistent, durable finish. These long-lasting needle springs will hold their shape and curve. Available in 19 different diameters, MusicMedic.com Needle springs are strong and consistent. Our 190 Spring Assortment contains 10 of each size spring in a white wooden block. Each spring size is labeled on the block as well as on the plastic tube to keep your springs organized. MusicMedic.com Blued needle springs are heat treated and very rigid yet not brittle. Many technicians find that Blued Steel springs give a faster, cleaner, or snappier feel to the key work of an instrument.These Blued Needle Springs are made from high quality steel with a machined point and completely consistent bluing. These long-lasting needle springs will hold their shape and curve. 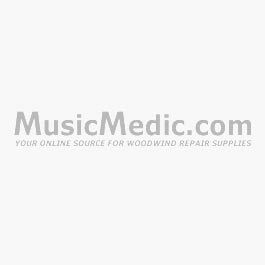 Available in 19 different diameters, MusicMedic.com Blued Needle springs are strong and consistent. Our 190 Spring Assortment contains 10 of each size spring in a white wooden block. Each spring size is labeled on the plastic tube to keep your springs organized. Starting with a Blued Steel Spring, we plate each spring with a thick coat of nickel. Nickel plating is very hard, nearly impervious to the elements and aesthetically stunning. Blued Steel springs, the base from which these springs are made, have a number of benefits over other springs available. The coating of hard nickel on each spring protects the Blued Steel Spring underneath from the elements and reduces or eliminates any problems with rust. Musicians with acidic body oils or living in coastal areas will benefit from the non-corrosive properties of a thick plating of nickel. Technicians can offer a beautiful, maintenance free spring as an upgrade to any instrument. These nickel springs will replace stainless springs with only a slight difference in appearance and a very noticeable improvement in feel.